The Arduino Robot is a robust little robot that is sure to please Arduino enthusiasts, tinkerers and beginner roboticists alike. The official Arduino Robot features two separate microcontroller boards: a robot brain to control the higher level decision making functions and a motor cortex to handle its motor control functions. 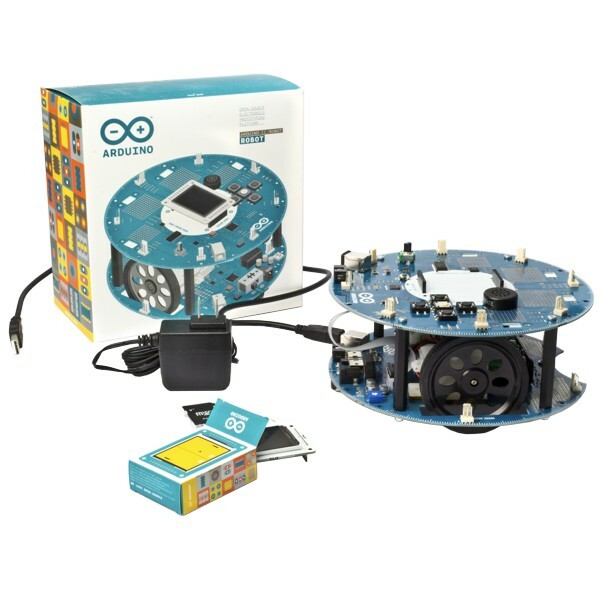 This is a powerful combination that enables the Arduino Robot to enrich the experience of beginners while providing a rich feature set for advanced tinkerers to enjoy. 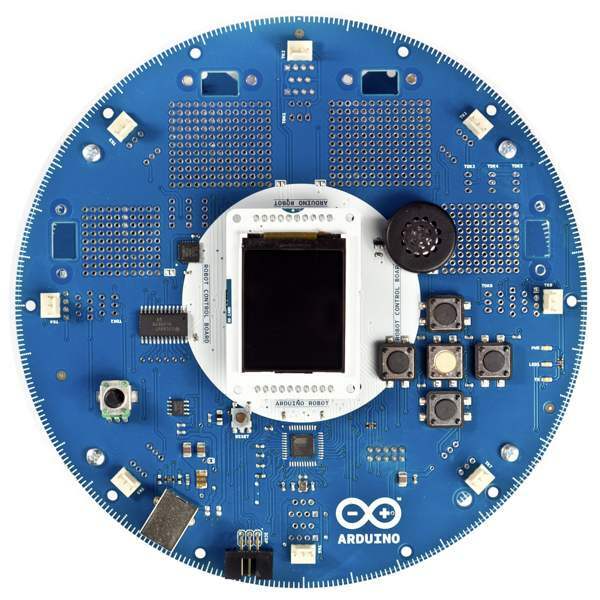 Everyone will enjoy programming the Arduino Robot's higher level brain functions while advanced users can also tinker with the lower level cortex. Both microcontroller boards are based on the Arduino Leonardo platform and each has its own ATmega32u4 processor with 32KB of FLASH, 2.5KB of SRAM and 1KB of EEPROM. Each microcontroller board has USB connectivity and is fully programmable. 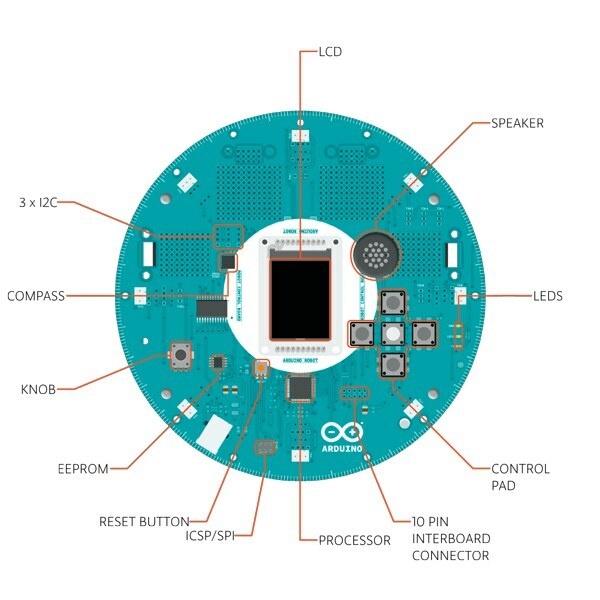 Each of the Arduino Robot's microcontrollers can be programmed independently by using the world famous Arduino IDE. A set of robot libraries is provided to make programming easy for beginners. Advanced roboticists will appreciate the Arduino Robot's clever design. 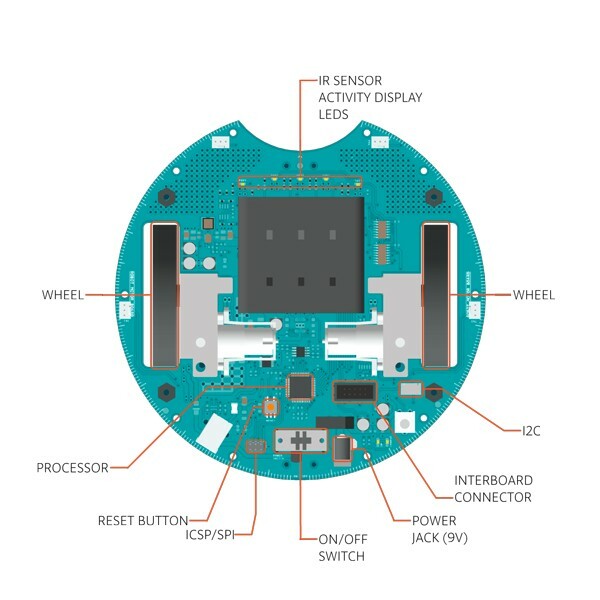 The Arduino Robot's brain is referred to as the Control Board and is located on the upper deck. It has an extensive User Interface with a full color graphic LCD display, audio speaker, analog potentiometer and a five button keypad. The Arduino Robot Control Board has 64KB of extra EEPROM memory and an SD card reader for plenty of onboard memory. The Arduino Robot's brain even has a compass to help it navigate the real world. The Arduino Robot's upper deck provides eight pre-soldered analog input connectors for I/O expansion and plenty of solder pads for advanced purposes. Additional pads are available to solder up to six more digital I/O connectors on this deck. Three I2C connectors are also available on this deck. The lower deck of the Arduino Robot is the Motor Board. Think of it as a motor cortex. It handles many of lower level details of motion freeing the Arduino Robot's brain for higher thinking. The Motor Board comes with a built in NiMH battery charger so your Arduino Robot is power friendly. All four rechargeable AA batteries and a 9V Adapter are included. The power system features an efficient DC to DC power convertor that provides steady 5V regulated power to the entire robot while keeping batteries running longer. There is an easy access on and off switch just in case you have a teeny tiny bug in your latest program and need to stop your Arduino Robot quickly. The Arduino Robot Motor Board has a small trimmer potentiometer to calibrate the wheels so that the robot runs straight. A set of five IR Infrared sensors are provided for line following and edge detection. This board also provides four connectors that can be used as analog input or digital I/O. It also has one I2C connector. 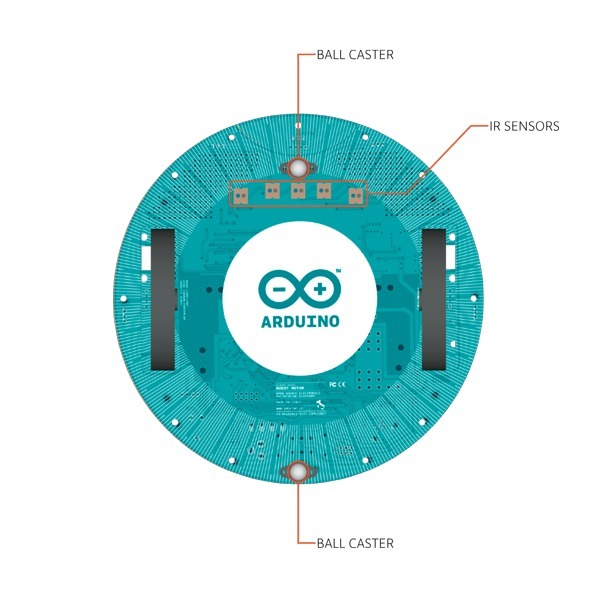 Both of the Arduino Robot's microcontroller boards are connected via a 10 pin cable that allows the Motor and Control processors to communicate with each other over embedded serial ports. The 10 pin cable also carries the power supply and additional information such as the battery charge level. The official Arduino Robot has is a great robot for anyone wanting to learn about robotics. It has features that even advanced roboticists can appreciate. It is ideal for anyone who wants a robot that is ready to play right out of the box. It includes everything needed to get started. You just need to charge the batteries to begin your adventure. Discover the fascinating world of robots today with your very own Arduino Robot! This little robot also makes a great gift!